This Thursday, many of us will gather around tables piled high with turkey, sweet potatoes and pumpkin pie. More importantly, we will pause to reflect on what we are thankful for and what we can do to help those who are less fortunate. From stocking the shelves of food pantries to wrapping gifts for children in need, the holiday season is a time of year when the spirit of compassion and generosity of American families is particularly apparent. This has been especially true in the last few weeks, as the United States has rallied a swift and life-saving response in the Philippines, where Typhoon Haiyan killed more than 4,000 people. Our disaster response teams – civilian and military – have already reached tens of thousands of survivors. Less than ten days after the storm made landfall, we had the water system up and running in hardest-hit Tacloban, supplying 200,000 people with clean water. “Our military personnel and USAID team do this better than anybody in the world,” President Obama shared in a video message. I couldn’t agree more. In these moments of crisis, we’re proud to represent our nation’s tradition of generosity, especially as we celebrate a holiday with its roots in the spirit of gratitude. At the end of the day, we remain committed to ensuring our assistance not only saves lives today, but reduces the risk of disaster tomorrow. From Syria (PDF) to Somalia, we’re working to bring long-term food security to the 840 million people around the world who go to bed hungry every night. We’re also working to reduce the high rates of poor nutrition that contribute to nearly half of all deaths in children under the age of five each year. In the last year, we have directly helped more than 9 million households transform their farms and fields with our investments in agriculture and food security through Feed the Future. We’ve also reached 12 million children with nutrition programs that can prevent and treat undernutrition and improve child survival. While there is still a lot of work to be done, we’re helping transform the face of poverty and hunger around the world – advancing progress toward the Millennium Development Goal to halve the prevalence of hunger by 2015, a target that’s within reach if the global community continues to strengthen our focus and energy. We know that hunger is not hopeless. It is solvable. If we continue to invest in smallholder farmers – especially women – and support good nutrition during the critical 1,000-day window from pregnancy to a child’s second birthday, we can meet the global challenge of sustainably increasing agricultural production for a growing population. By scaling up promising innovations from farm to market to table, we can tackle extreme poverty by the roots and shape a future of prosperity and progress. This week, we’re thankful for the opportunity to be a part of this collective global effort and wish you and your families a happy Thanksgiving. 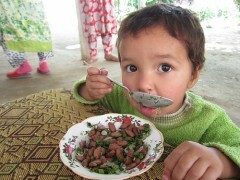 Want to be part of the solution to hunger and poverty? Find out how you can help contribute to typhoon relief efforts in the Philippines or learn more about how to get involved with Feed the Future. Led by USAID, Feed the Future draws on the agricultural, trade, investment, development and policy resources and expertise of 10 federal agencies. Learn more about USAID’s long history of leadership in agricultural development.